Plot Summary: The plot for Tenshi no Tamago is not something that can easily be related in words. The film is largely about the presentation more than action, and understatement instead of open revelation. Existentialism abounds, heightened by the moody artwork and the dialogue, which asks more questions than it answers. Bear in mind, however, that the conflict in the plotline primarily occurs in the audience's mind, not in any sequence of actions in the film, spurred by speculation arising from one jarring impression after another. 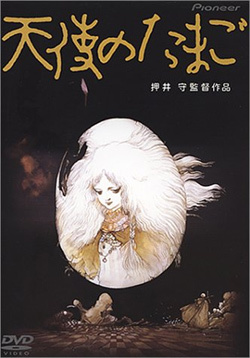 There are only two primary characters in Tenshi no Tamago: a young girl who bears an egg and a man who holds a strange cross. The audience is left to speculate as to the identities and true personalities of these two images which act in this disturbing world. Indeed, much of their dialogue involves the question "dare ka" (who are you). For such an existential film, however, this is perfect, as any open declaration of their thoughts, instead of such questions and mysterious actions, would ruin the mystery of the film.